Indonesia presents a host of challenges that can impede the ability of foreign business players from operating at full stride. Among these challenges, the multiple and often overlapping layers of policy making and regulations makes for a complicated operating environment. 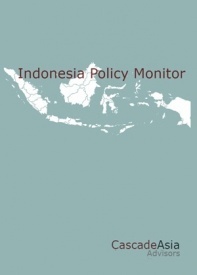 Cascade Asia developed the Indonesia Policy Monitor as a complementary service to help foreign companies monitor newly passed and pending legislation and regulations. The November 2016 issue of the Asia Light Manufacturing Outlook report is a 6 page executive-ready assessment and outlook designed to help companies anticipate labor risks and dynamics across key manufacturing countries in Asia. Countries of coverage include Cambodia, China, Indonesia and Vietnam. This monthly outlook includes labor issues and events on the horizon, inclusive of inflation and currency forecasts. The October 2016 issue of the Asia Light Manufacturing Outlook report is a 4 page executive-ready assessment and outlook designed to help companies anticipate labor risks and dynamics across key manufacturing countries in Asia. Countries of coverage include Cambodia, China, Indonesia and Vietnam. This monthly outlook includes labor issues and events on the horizon, inclusive of inflation and currency forecasts. The September 2016 issue of the Asia Light Manufacturing Outlook report is a 5 page executive-ready assessment and outlook designed to help companies anticipate labor risks and dynamics across key manufacturing countries in Asia. Countries of coverage include Cambodia, China, Indonesia and Vietnam. This monthly outlook includes labor issues and events on the horizon, inclusive of inflation and currency forecasts. The August 2016 issue of the Asia Light Manufacturing Outlook report is a 4 page executive-ready assessment and outlook designed to help companies anticipate labor risks and dynamics across key manufacturing countries in Asia. Countries of coverage include Cambodia, China, Indonesia and Vietnam. This monthly outlook includes labor issues and events on the horizon, inclusive of inflation and currency forecasts. 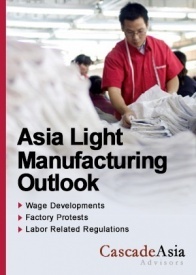 The July 2016 issue of the Asia Light Manufacturing Outlook report is a 3-5 page executive-ready assessment and outlook designed to help companies anticipate labor risks and dynamics across key manufacturing countries in Asia. Countries of coverage include Cambodia, China, Indonesia and Vietnam. This monthly outlook includes labor issues and events on the horizon, inclusive of inflation and currency forecasts.